Readers of Pacific Horticulture can get a 10% discount on classes simply by entering coupon code PACHORT10 at checkout. Offer valid through August 1, 2015. Tending a garden is a constant education. Mistakes can be costly or do permanent damage to plants. Whether you’re looking to install a drip irrigation system, trying to summon the nerve to prune a Japanese maple, intrigued by the notion of grafting, or new to the idea of container gardening, Garden Tribe offers anyone with an Internet connection access to experts—and inspiration. A conversation between editor Lorene Edwards Forkner and Garden Tribe creators Jen Long and Beth LaDove. 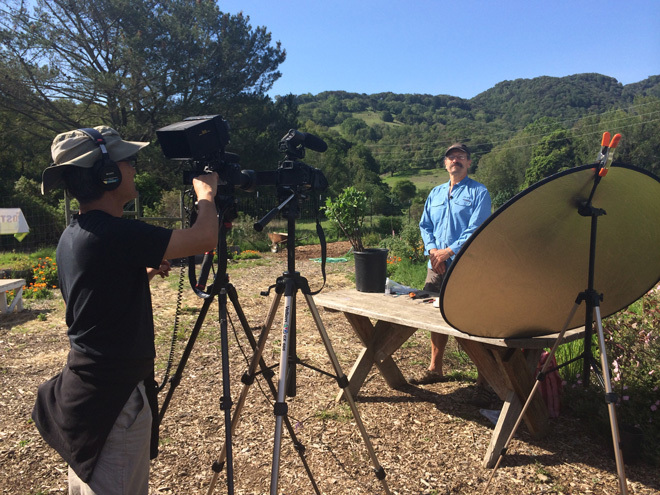 LEF: How did the idea for creating a series of streaming online video classes that teach garden skills come about? GT: We met two years ago volunteering for our local Master Gardeners organization. We were working the “Help Desk,” answering questions about how and when people should do things in their garden. This was nothing new for us—as lifelong gardeners we had been fielding these kinds of questions from our friends and family for decades. And we knew that the best way to answer those questions was to literally show people what to do. One day it clicked. By moving the interaction online we could connect home gardeners to experts. It was clear to both of us that video would be the best medium for this kind of teaching, so we could show and tell at the same time. LEF: You seem committed to users being successful. Tell us a bit about how your courses work. GT: We invest a lot into finding exceptional teachers. Gardening isn’t a one-solution-fits-all craft. Every gardener, every garden, every plant, every season, is different. So when we select a teacher, we aren’t only choosing someone who can show you how to do things, but also someone who can teach you how to make decisions in the real world. We work with our teachers to create the class content, and then shoot video out in the field, so that our students get an authentic experience of what it’s like to learn from that expert. 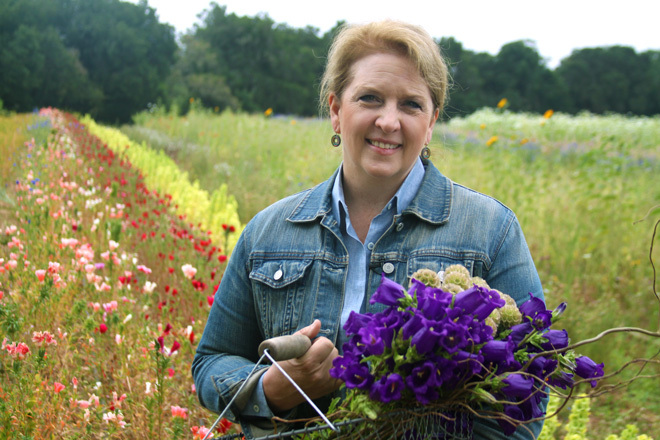 American grown cut flower advocate Debra Prinzing. Photo: courtesy of Garden Tribe. Our classes are designed to either open up the door to a joyful project, or break down a complex process into actionable pieces. Learning how to cut and arrange your own flowers with Debra Prinzing sets you up to enjoy a lifetime of beautiful and inexpensive bouquets. Installing drip irrigation the easy way (no plumbing required!) lets you water those flowers without lifting a finger. Each class is made up of several lessons. The video components add up to 45 to 75 minutes per class, but once you buy a class you can go at your own pace, and go back to re-watch pieces anytime. We tackle the key aspects of the subject (tools, supplies, techniques, etc.) and include downloadable material featuring step-by-step, detailed instructions. LEF: Who is taking Garden Tribe classes? GT: Instinctively we know that an interest in gardening defies demographic boundaries. People are simply hardwired to garden. That said, we’ve been surprised—and delighted—by the range of people taking our classes. Our classes were originally made for home gardeners, but right away we noticed that floral and landscape professionals were signing up too. We thought our initial students would come from our local community, but it turned out that some of our first students were from Mexico and Australia. We think of our classes as a shortcut to success. Our teachers are delivering decades of hard-won experience, often in less than an hour. It’s the kind of information that makes the difference between having a great garden this year, or living with more of the same. And you don’t have to drive or fly anywhere to get it. LEF: I love the name Garden Tribe—it implies community. What’s next? GT: We continue to experiment with ways to connect the dots for gardeners, online and off. This past spring we launched a free online Boot Camp; a 21-day, 21-lesson series to help people plan and plant an edible garden. We’re always adding new seasonal content, classes, and events to our offerings. To find out about new content, classes, and events sign up for the Garden Tribe mailing list at www.gardentribe.com.